Studio City was inspired by Hollywood, so walking The Boulevard at Studio City will have you feeling in complete synergy with the city. Browse through over 35,000 sq. metres of luxury brands regularly spotted on red carpets internationally, including designer labels such as Marni, Balmain, Prada and more. As you stroll through the streetscapes of this bespoke designed mall, it’s hard not to feel as though you’re pounding the pavement in New York’s Times Square and Beverly Hills’ Rodeo Drive. 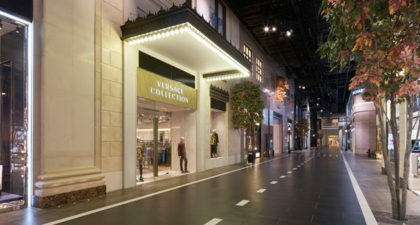 The recreation of these iconic shopping districts in the heart of Macau is uncanny. For those all shopped out, there’s an abundance of entertainment nearby, including theatre shows and Studio City’s famous figure 8 Ferris Wheel, Golden Reel.